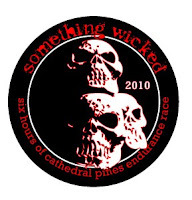 ...tomorrow, 6.1.2010 @ 12:00pm for the Six Hours of Cathedral Pines Endurance Race. This year's race is capped to 250 participants and preregistration is required. DayOf registration is reserved for Pro racers only. We've got some other stuff cookin' on the grill to go along with our obligatory event pint glass and shirt. Live your life. Register and do Something Wicked! ...and burning! We're super psyched for the 2010 event. It's early in the season, but we're giving you more than enough lead time to build this one into your race schedule. If you thought last year was fun, wait until you see what we've got brewing up for y'all in 2010. You've got six months...now get your train on! KEEP YOUR EYES ON THE SITE!